This Fourth of July Southerners On New Ground is holding Crush the Confederacy events and actions in 5 states throughout the South — in Virginia, Tennessee, North Carolina, Georgia, and Mississippi – to call for a type of independence that is rooted in interdependence. We believe true independence requires community and governance beyond racialized and outdated notions of citizenship. LGBTQ, Black, indigenous, and immigrant communities are not a threat to one another, in fact, we need each other to survive. We’re calling to all those whose lives, communities, bodies, and livelihoods are being targeted by our Southern legislators with their right wing agenda. We’re calling to all those who have cause to call the organizations and elected officials (especially southern governors) who continue to put targets on our backs into the ring. We call on all of us who have cause to fight, to join us in fighting for a region and a country where liberty doesn’t come at the cost of violence and hatred but where we claim our belonging, our right to stay, and our liberation. At our Crush The Confederacy actions, SONG members will be performing Frederick Douglass’ classic speech, What, to the Slave, is the 4th of July. This hisoric speech is still relevant 165 years after it was first written. It’s crystal clear that there is an agenda in our region that is anti-trans, anti-queer, anti-immigrant, anti-Black, anti-Muslim, anti-woman and anti-worker. Every one of these communities has seen virulent hate speech and hate policy in the past six months. We’re holding these events to expose the architects and leaders behind this speech and policy. For decades, the right wing, and especially the Christian Right, has put a target on our backs. We think it’s important that the mystery is unveiled. Just like leaders of the KKK liked to remain hidden, the leaders and architects of this Confederate Spring we’ve been experiencing do not always show themselves so boldly. 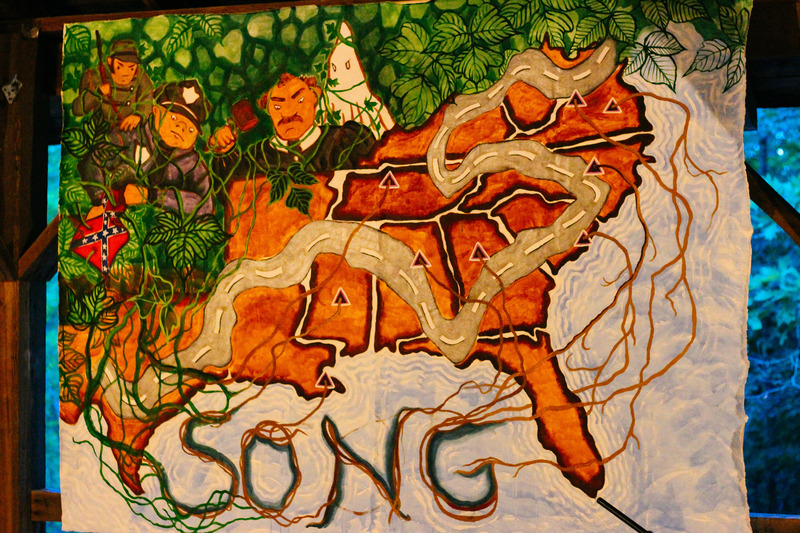 The Counter The Confederacy events and actions are part of SONG’s summer strategy to expose, confront, and disempower right wing organizations, institutions and leaders who are attacking our people with full force. Throughout the summer, we will be utilizing cultural organizing, campaign organizing, and litigation to repeal HB2 and take down other proposed legislation like Blue Lives Matter, bills that attack hard won sanctuary cities for immigrants, proposals to undermine access to reproductive health care, and other policies that making living impossible or dangerous for our communities. We are looking for those willing to fight for a people’s agenda that is pro-poor, pro-Black, pro-worker, pro-immigrant, pro-queer, pro-trans, pro-choice, and pro-local democratic control over our communities. Visit this page again for videos and photos of the action!